Every place has a rhythm, a thumping a heartbeat which pumps life and energy and spirit into its land and people. Some towns flow mellow-ly, like slow swells lulling toward a sandy shore. Other cities pulse intensely, with flashing lights and clacking high heels and bus lines that run all night. An object in motion stays in motion, or so said physicist Isaac Newton in his first law of motion; and so also says the European hub of alpinism: Chamonix, France. Its mountains rise and then crumble, its glaciers grow and then carve, its humans live and ski and climb and hike and run. Chamonix has an indefatigable beat. It doesn’t stop, can’t stop, won’t stop. It is the perpetual motion of place and people. We invite you to jam to Chamonix’s beat. For those who call this valley their home, movement is intrinsic. Internal. And as a visitor, once you feel it, you can’t un-feel it. To get a feel for its mountain flow, let’s run up Chamonix’s famous vertical-kilometer (VK) course, a route that starts in downtown Chamonix and tops out 3.8 horizontal kilometers and one vertical kilometer later at Planpraz, a lofty plateau north of town. You wake before the sun does, then jog your way through silent Cham. You head past the bakeries, which are firing up their ovens in this dark morning hour. Those baguettes don’t bake themselves, eh? Up the steep pavement of Rue la Mollard, you simultaneously marvel at this road’s engineering and realize that, since you haven’t even hit dirt yet, getting up this route will be a bit more simple in theory than in practice. The Chamonix VK trail is carved into the mountain under town’s Planpraz gondola. It’s a steep, sharp trail that zig-zags itself somehow both vertically and horizontally up the mountain. It’s definitely doable, but doesn’t exactly scream beginner friendly. You power your way along the dirt singletrack, zigging, then zagging, and zigging again. The skyline glows orange and your sweat starts to bead. You say a silent “thank you” to your shoes’ grip, and chug away. At first ragged, your breath settles into a rhythm, intentionally hard yet steady, as you push upward through the morning’s silence. One third of the way up, you realize that someone started even earlier than you—and she’s wearing a blouse and sandals. This elderly woman–she has to be about 85 years old and is clearly a local–is picking wild strawberries. She headed so early uphill because, well, she wanted to get to the strawberries before anyone else did. She hums as she plucks the berries, fat and red with the Chamonix sun, and places them into her market basket. She winks and grins as you pass. You finish the rest of the course, scrambling over the spicy cliffs that make up the final stretch, gripping cables and stepping onto metal foot pedals drilled into the rock, both in place to protect you from the humbling bits of exposure. You smile across the valley at the Mont Blanc massif, appropriately glowing a brilliant white in the bright sun. You take a minute to sit on the grass in the sun’s warmth, drinking in the morning view. The pressing rhythm of your vertical kilometer’s worth of effort is about to settle out, yet you realize there are plenty of others who will carry the beat on. Up here on the grassy flats of Planpraz, delivered by the gondola you climbed under, are a number of paragliders preparing to float their way back down to Chamonix. Among this group, you notice, is a French man in his mid-thirties with a dog–the kind with fluffy hair like a mop. You sort of wonder what the dog’s going to do while its owner paraglides. That is, until you notice that both man and hound are wearing harnesses. The dog oozes chill as its owner crouches, connects their harnesses together–doggo clipped horizontally in front of its owner–and stands in the takeoff zone. The dog’s dreadlocks drip from all four legs, swaying in the breeze, while the pair waits for the right wind gust. You laugh aloud as you realize that this is 100% normal for them. When their fabric wing floofs up into the wind, the human runs forward and the flight begins. With a whoop and an “Allez!” they’re off. Just another day, another flight for two buddies. If you were to ask, the paraglider would tell you that he and the dog do this “all the time,” and that they’ve performed over 200 jumps as this flying dog-and-human duo. What goes up must come down—what’s with all these physics references, anyway–so via another more meandering and civilized trail, you return downhill to Cham, now bursting with stories and mountain energy. You, too, become a part of the cycle, of taking the energy of town to the mountains, and the energy of the mountains back to town. By the end of today—that is, every day—Chamonix pulses with the energy brought down from the peaks by runners, hikers, paragliders, and skiers. It’s an up-and-down, a loop. Now tapped into Cham’s energy and beat, it’s impossible not to share it, with your friends and family, with strangers on the streets, and perhaps even with a paragliding pup. Chamonix is the universal playground. It’s got something for everyone, and welcomes every kind of everyone. 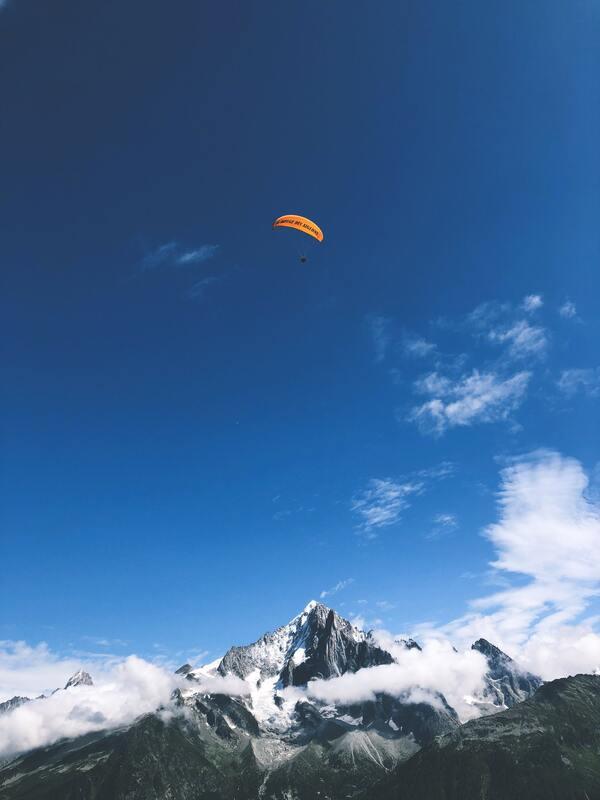 If you take a walk through Cham, you’ll find skiers from Japan, climbers from Mexico, and paragliders who were born and raised in the valley itself. 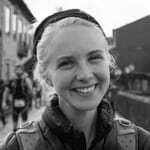 Languages drift through the streets; a couple from Saudi Arabia spins through town on rented mountain bikes; a Russian family shares French fondue at an outdoor restaurant. Two girls amongst a sea of adventurers in central Chamonix. Mountain towns can be infamous for their strict no-sleeping-in-your-car policies—tickets delivered and vanlifers ousted, no matter the hour. In Chamonix, it’s all different. Car camping and van living are allowed within the city limits. In Chamonix’s camping zones, there’s a constant flow of people. Let’s take a walk down a stretch of the Arve River, heading out of Chamonix and toward the village of Argentière. This section of the Arve blooms with wildflowers–fuchsia fireweed with their stalks stretching to two meters in height and more tempered white daisies growing right at the edge of the forest. Campervans line its east bank, and the west side of the river hosts hiking paths and official campgrounds. As you walk past one of the campgrounds, an older French couple steps out of their campervan. The two of them head out for a walk along the Arve; they don’t speak English, but also don’t hesitate in saying hello to every passerby. And they also don’t hesitate in telling you their story. They came here one summer about 30 years ago with their kids in tow, became hooked, and kept coming back. Their children, who grew up spending every summer in Chamonix, squinting up at Mont Blanc through the pines, have since grown; they take their own summer adventures. But their parents, now in their late seventies, still summer in Cham. The retired couple spends their summers washing dishes in the sunshine and sleeping to the patter of mountain rain on their roof. They take to the trails during the day, bonjour-ing their way uphill, past a smorgasbord of language speakers. When it’s time to descend back home, their evening starts with a campfire dinner and ends with a sunscreen-scrubbing, dust-rinsing shower in the campground’s communal bathroom. During their Cham summers, the couple’s neighbors are always changing. This is one of their favorite parts of these vacations. On Monday, they might be living next to a seasoned mountaineer. Then on Tuesday, in comes a couple with a six-month old daughter (who might also, one day, become a seasoned mountaineer). For many average European families, this budget-friendly, mountain-accessible attitude makes the Chamonix Valley a totally do-able place to vacation. And in such accessibility is an inferred inclusivity. Come one, come all. Link in to the energy and beat. Add your own flavor to Chamonix’s diversity and learn about another’s. Everyone is welcome here. In Chamonix’s accessibility is an inferred inclusivity–all are welcome here. 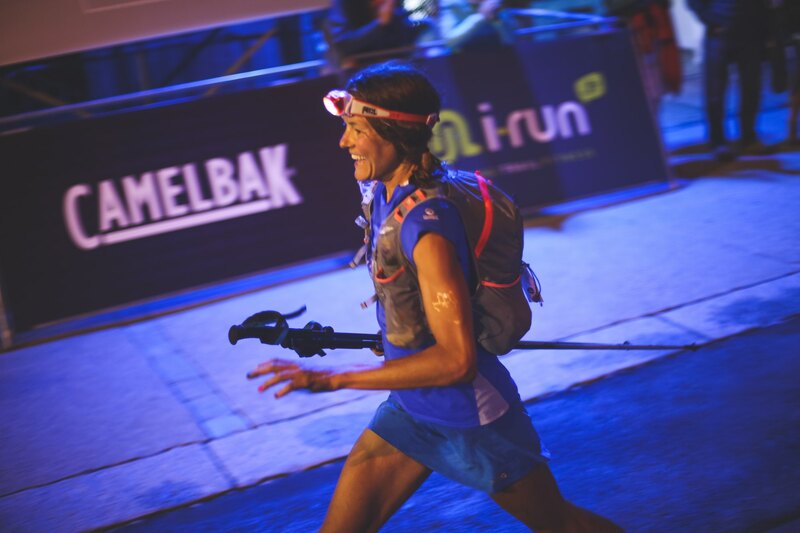 There’s the rhythm of Chamonix… and then there’s the beat of Chamonix during UTMB. 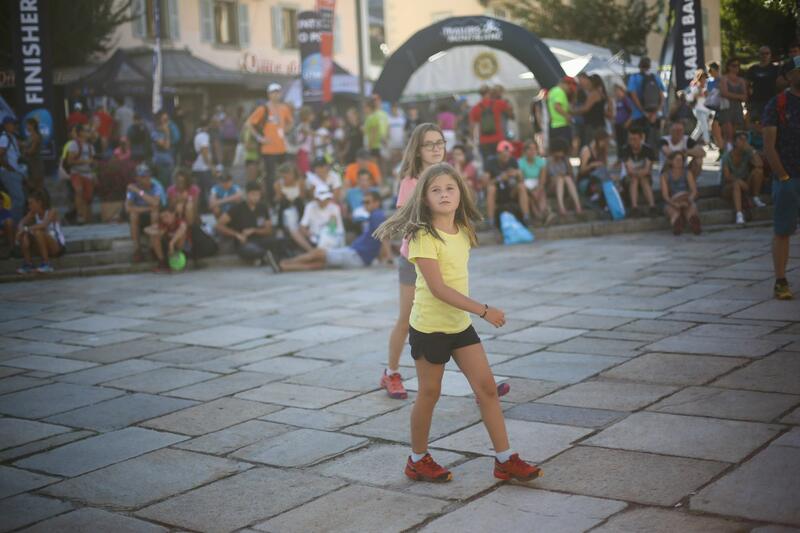 If Chamonix is already a place that hums with energy, then UTMB week is its Energy Olympics. We’re talking about six races and more than 10,000 total runners with their respective support networks in tow. 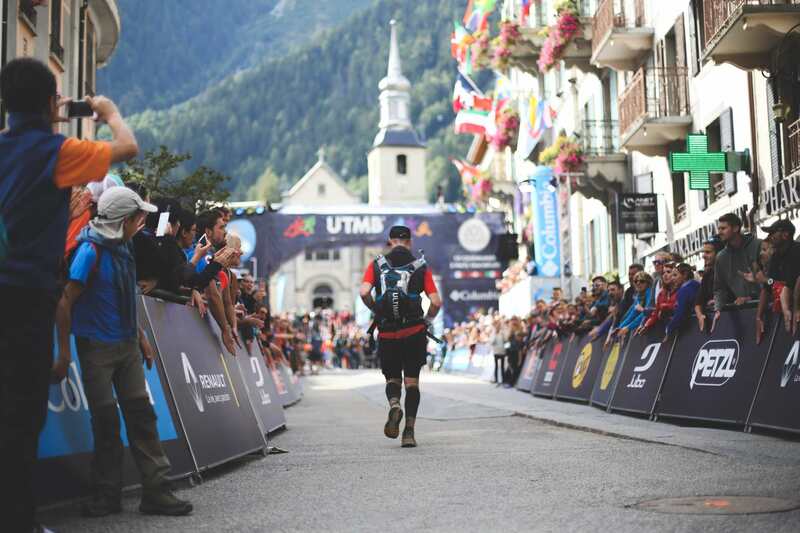 The motion of UTMB is, in many ways, obvious—I mean, the point of a race is to be moving, isn’t it? 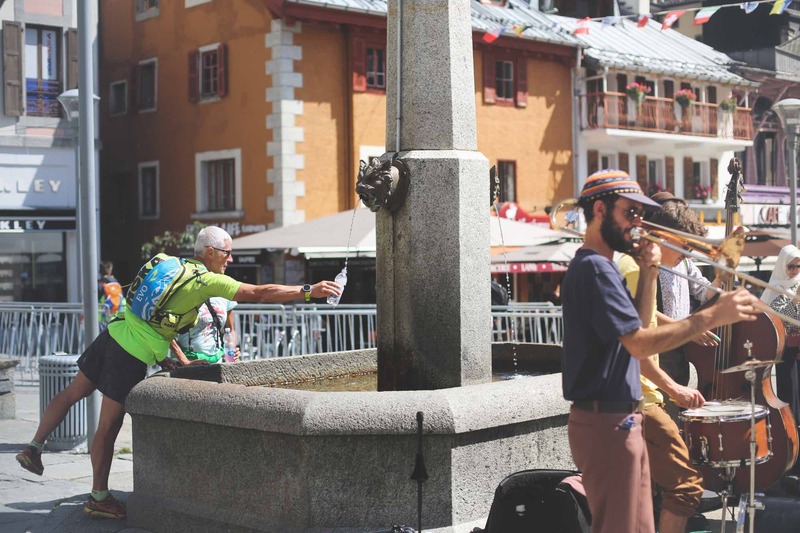 There’s plenty of this expected energy during UTMB, especially at the arch in Chamonix’s center, erected to serve as many of the races’ start and all of the races’ finish lines. It roars with the arrival of finishers, and explodes as each race’s fresh runners gallop into the mountains. But if you spend an hour there before or after these crescendos of action, you’ll live the race’s less conspicuous rhythm. In fact, let’s take a 3 a.m. trip to the finish-line arch. Don’t worry, you can stay in your pajamas. You don’t find the deep crowds or blasting music at this time of the morning, but there’s still no stillness. You stand next to parents, coffee-d up after a full night of crewing their adult son. You watch a boyfriend waiting for his girlfriend, bearing a bottle of champagne to pop when she arrives. There are bright-eyed babies and wide-awake grandparents and bar goers who’ve encountered their perfect after party. 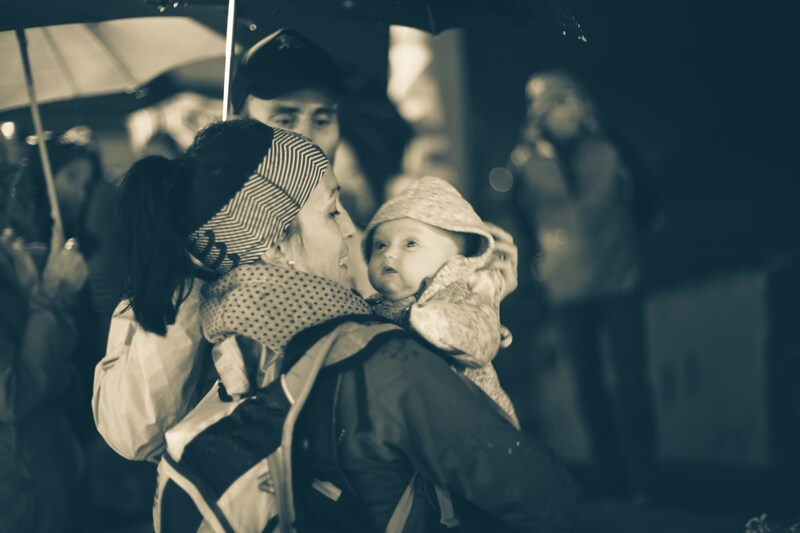 There’s no bedtime at the UTMB finish line. The littlest fans come out to cheer during UTMB. And if you listen, you’ll hear that this energy ripples quietly yet pervasively into the night. It’s contagious, irresistible. The energy spreads through town and up onto the trails. Supporters shout love for their runners, waiting to run with them in their final kilometer. Headlights dance along the trails, rising through the darkness as people scout out places to stand and cheer. Far-away cowbells clang and whoops echo, even in these dark hours before the dawn. Every moment during UTMB week is someone’s moment. Someone’s runner, someone’s lover, someone’s sister or dad is coming home. Though the UTMB motion is out of the ordinary for Chamonix, the funny thing is that it never completely stops. 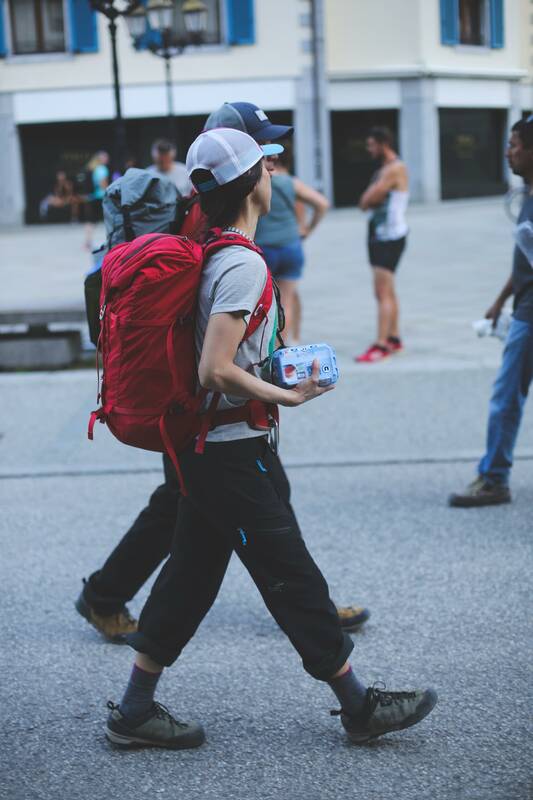 There’s no ‘first runner’ to arrive in Chamonix, or ‘last runner’ to leave post-UTMB. Sometimes, people come once and get hooked; they come back for a season or a year. Or the next year, they bring a friend, or their family, and a campervan, too. That it’s a rotation, a perpetual in-and-out, is what makes this place such a meeting ground. A runner approaches the iconic UTMB finish-line arch in front of Chamonix’s historic Église Saint-Michel. After six days out on the trails, listen in as the last team to finish the PTL, the longest race in the UTMB festival, arrives to Chamonix. The beat of Chamonix is the perfect adventure soundtrack. The beat is grandma on the vertical-kilometer course. It’s the gondolas that always come down once they’ve gone up. It’s the mountains that claw the sky and the glaciers that carve. It’s the baristas cranking out the caffeine and the bakers rolling out baguettes. It’s the ibex that contours flawlessly on the steep scree. It’s the baby who screeches with delight when mom finishes her race. It’s the campervan couple that returns every summer, and the South African runner who visits for his first year. It’s the raptors lifting themselves on the morning breeze, and the paragliders–and pup–who emulate that motion. It’s the first runner who welcomes in the final finisher. It’s running down a mountain and singing along, at the top of your lungs, to a song that you love. It’s peace and silence and yet a deafening beauty all wrapped into one. This is the beat of Chamonix. 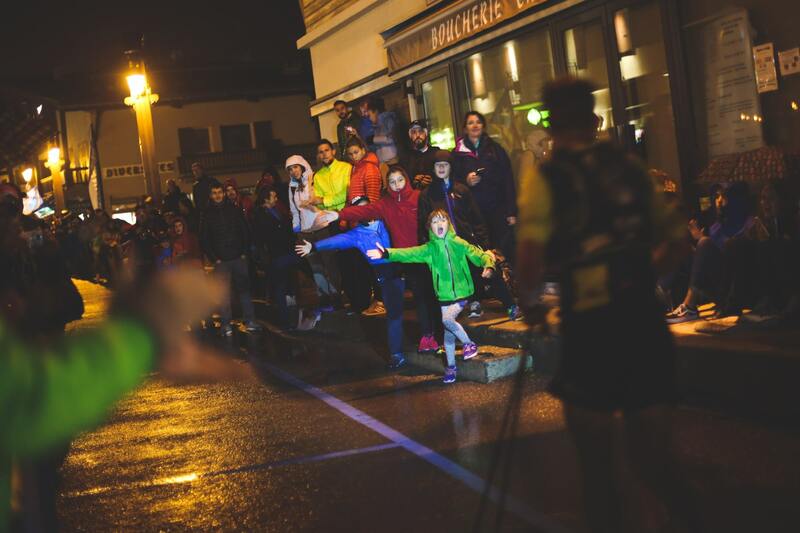 Even at night and in the rain, you can feel the beat of the UTMB. Rory Bosio carries the Chamonix spirit across the finish line of the TDS. Love it! Hope to visit someday. All the best from southern Spain. Great article Kirsten! You really managed to capture the spirit of Cham. Whether in summer or in winter, it’s all about sports and the love for the mountains.